Ruby is one of the most precious and sought after of all gems on the market. Ruby, along with sapphire, belongs to corundum family of minerals. 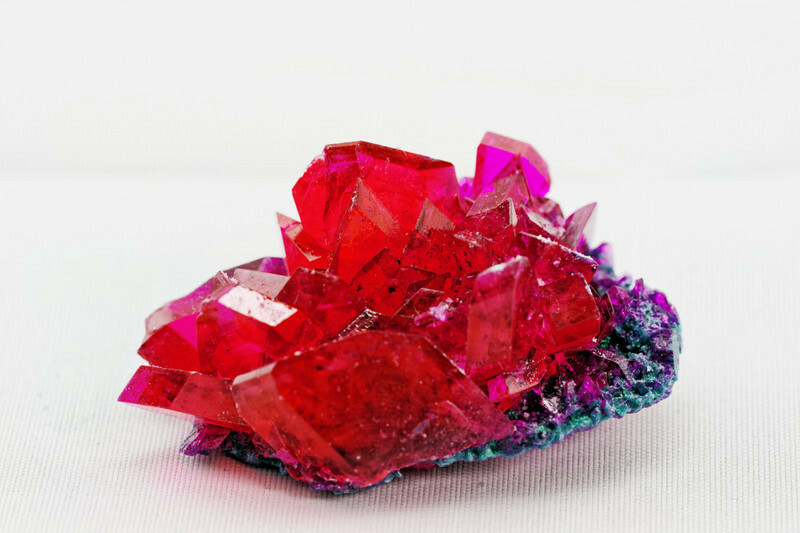 When corundum is red it is called ruby and all other colors (blue, pink, and yellow) of corundum are called sapphire. 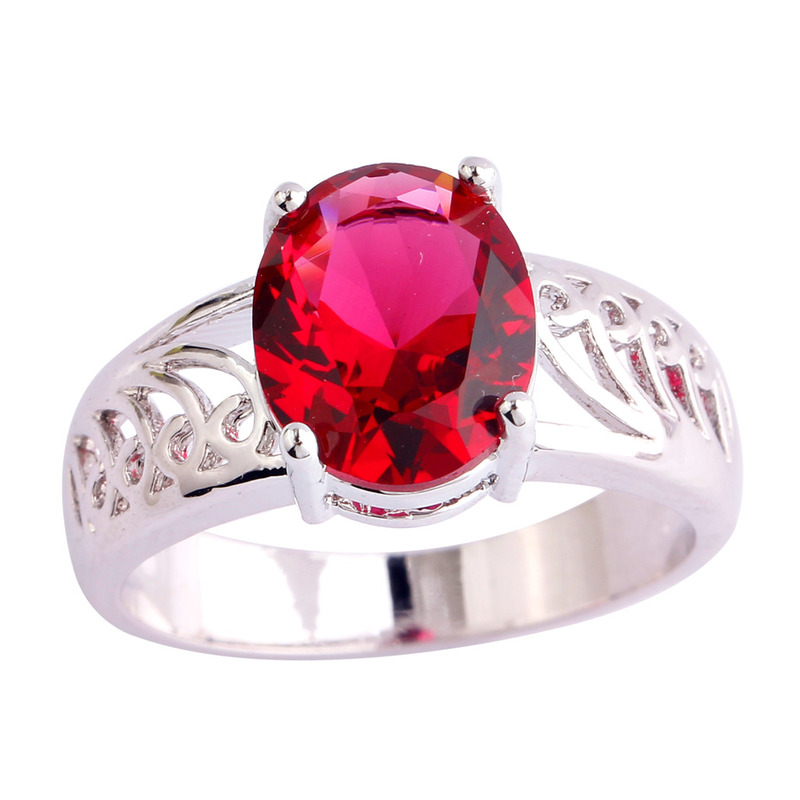 The beautiful red color of ruby is due to presence of chromium. Ruby is a very hard gemstone, therefore it is very ideal to be used in all types of jewellery and not worrying about the damaging the stone. 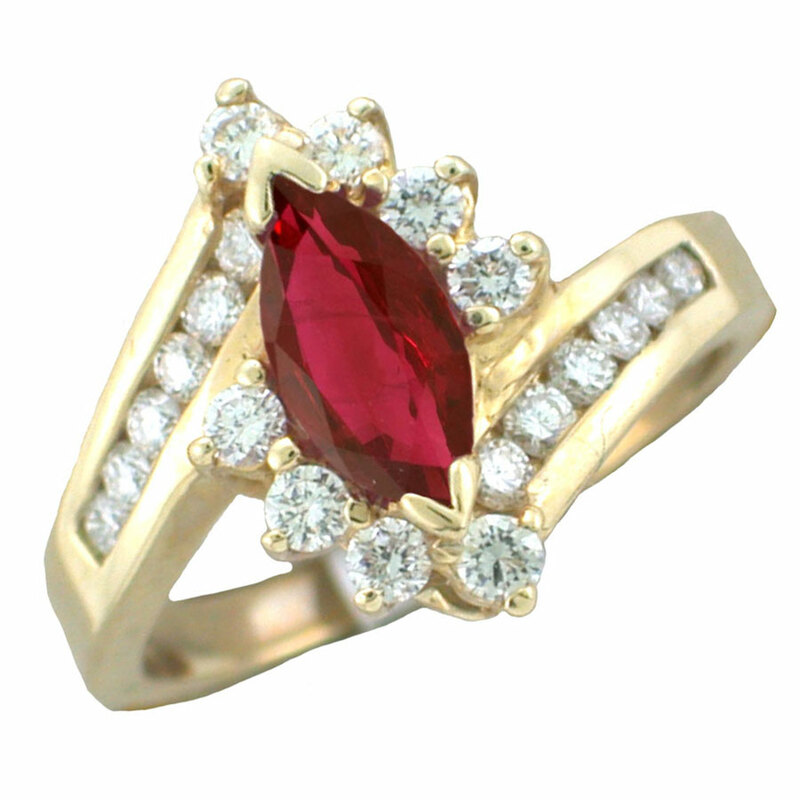 Complete information about ruby gemstone is found here. Furthermore, the scarcity and incomparable magnificence of ruby has connected this gemstone with legends throughout the history, here you can find more information about the history and meaning of ruby gemstone. Ruby is often used in engagement rings. This is because of its beautiful powerful red color, also because ruby symbolizes truth, uniqueness, vitality and undying passionate love. Furthermore, ruby is the gemstone for people born in July. Regardless of the reason why you are buying ruby jewellery (either engagement ring or as your birthstone), it is very important to read this complete shopping guide to learn how to choose the best ruby for your money. There are a lot of factors that determine the value of ruby gemstone. These factors include, color, clarity, cut, carat, which are sometimes called 4 Cs, source, types of treatments, being natural or synthetic. In following sections we explain these factors in details. 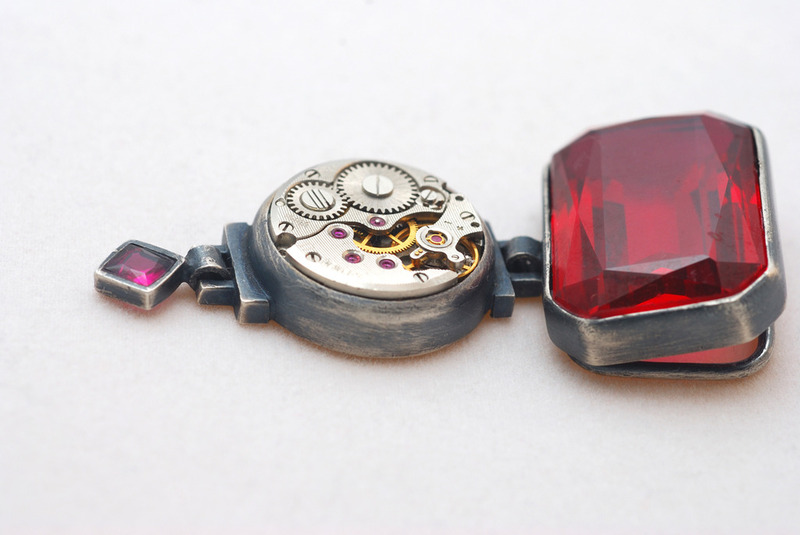 As one might think, color is one of the most important factors that determines the value of ruby. Color of gemstone consists of three qualities: hue, tone, and saturation. Red is the primary hue of a high quality ruby (due to presence of chromium). Tone is the measure of how dark the color of the gemstone is. Tone varies from colorless (0) to black (10). The most valuable rubies tend to have a deep tone (medium and medium dark tone, 6) Saturation is used to measure the intensity of the color and in varies from gray (1) to vivid (6). The more intense the color, the more precious the ruby is (vivid saturation, 6). To sum up in a simpler language, it is often said that the most expensive rubies displays a bright blood red with a hint of blue, or as it is often described, “Pigeon’s blood red”. Uniformity of the color is another important factor determining the value of the ruby. As a rule of thumb, the more uniform the color, more expensive the gemstone is. Clarity refers to the transparency (diaphaneity) of ruby and anything that impact the transmission of light in the gemstone. Transparency has a bigger impact on the value of ruby as compared to the color of the ruby. For instance, an opaque ruby with the best red color has less value as compared to a similar sized transparent ruby having purplish color. All natural rubies will contain some level of inclusions (crystal needles of the mineral rutile or silk inclusions) and these inclusions and other imperfections severely impact the clarity of ruby. As a practical tip for buying ruby, you should look for eye-clean rubies, meaning flaws and inclusions in the gemstone should not be seen by unaided eye. Rubies without any inclusion are extremely rare. Therefore, if the ruby that you have chosen does not have any inclusion on examination under a hand lens or loupe, it is most likely to be a synthetic ruby. In other words, inclusions are the proof for the genuineness of the gemstone as all original rubies would contain some level of inclusions. It is worth noting that, in the case of some rubies which are called star rubies, the presence of inclusions can actually increase the value of ruby. In star rubies, due to the optical phenomenon of "Asterism", silk inclusions in the ruby reflect light in the form of six-ray star. Ruby gemstones are found in a wide range of shapes and cutting styles, including round, pear, emerald, marquise, square, cushion, cabochon, and baguette cut. Cutting style is not as important as color and clarity in determining the value of ruby gemstone. However, the importance of cut should not be underestimated. For instance, only with a proper-cut ruby can look bigger in spite of being less in weight and only with a perfect cut the true glow of the ruby is revealed (due to maximizing the light return). For the same quality of color and clarity, emerald cut is the most expensive cutting style. This is followed by round, pear, marquis, oval, and cushion cuts. Cabochon which is the least valuable cut is usually used for star rubies or less quality rubies. Well-cut ruby should maximize the light return to enhance the brilliance of the gemstone. As one might expect, the larger the ruby, higher the price will be. Most of the rubies on the market are small in the carat weight. As a matter of fact, high quality rubies beyond 3 carats are extremely rare. The price of ruby will increase exponentially when the weight hits one and three carats. Therefore, if you are considering buying 1 ct. ruby, it might be a good idea to buy 0.9 ct. ruby instead as there is a huge gap between the price of 1 ct. and 0.9 ct. ruby. Depending on the quality and size, the price of ruby can vary between few dollars per carat for small and low-quality rubies to tens of thousand dollars per carat for very high quality rubies. For instance, on May 2005 a faceted ruby was sold for $1,266,901 per carat. 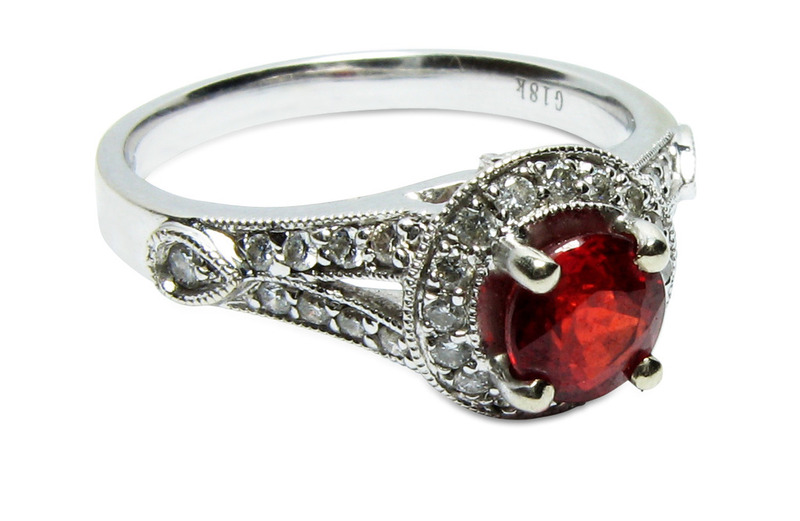 Heat treatment is a very common practice for many rubies sold today. As a matter of fact, buyers should always assume that ruby has undergone under some level of heat treatments (from very slight to quite extreme heat treatment) unless sellers disclose otherwise. Heat treatment is used to enhance the color and the clarity of the gemstone and the results of heat treatment are usually stable and permanent. For lower quality and smaller size rubies the value of the heat treated gemstone is almost the same as untreated rubies of the same quality. However, for finer quality rubies, depending on the level of heat treatment, the value of the ruby can drop drastically for heat treated rubies. As a general rule in estimating the value, rubies with high quality color and clarity are more expensive when they are untreated. Other treatment methods can also be used to improve the color and clarity of rubies. These methods include, surface diffusion, flux healing, and filling ruby with leaded glass (glass-filled ruby). In surface diffusion and flux healing an extra material is added to the surface of ruby to make its surface flaws less visible. For instance in surface diffusion method, rubies are heated very close to their melting point in the presence of chromium source. 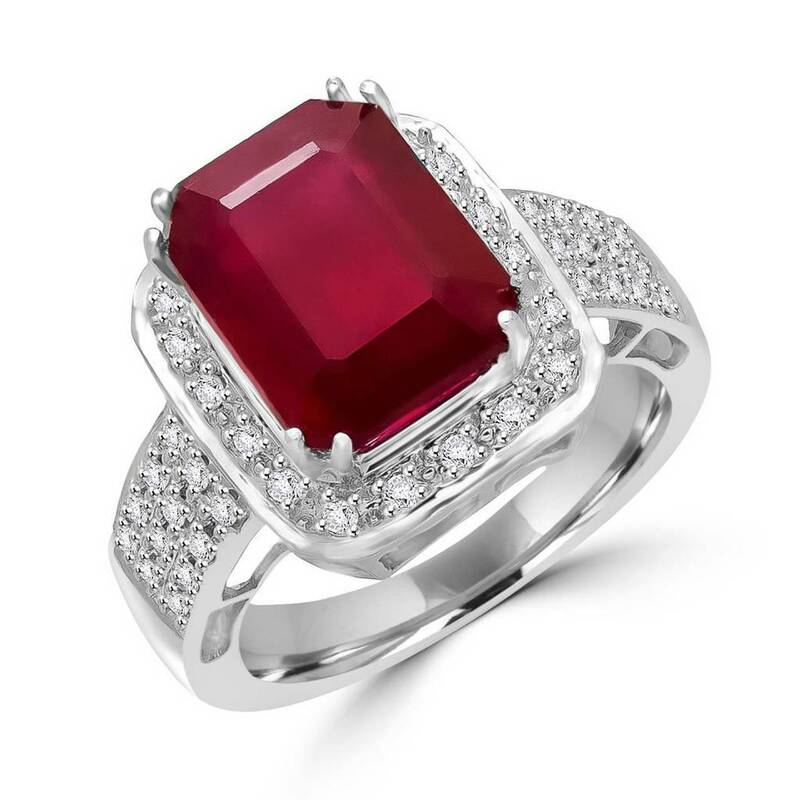 Chromium enters into the structure of ruby and enhance the color and the clarity of the ruby. Rubies treated by surface diffusion and flux healing tend to be much less valuable as the added material will wear off at some point. Filling ruby with leaded glass is usually performed for the rubies with a lot of inclusions and fractures. In this method, to increase the transparency of ruby, it is filled with leaded glass (or sometimes Bismuth). Glass-filled rubies have the leased value as compared to the rubies treated by the other mentioned methods. It is very important to note that regardless of the treatment that has been performed on ruby, its treatment should be disclosed by seller. So before buying, you should always ask whether the ruby has been treated in any way or not. This is very important as it does affect the price of the ruby. Finally, if you are buying a very costly ruby gemstone, make sure you ask for a gemstone certificate issued by an independent Gemological Laboratory. Natural rubies are formed under a great heat and pressure over a very long time; synthetic (man-made) rubies can be created in a laboratory in a very short time. Synthetic rubies are real rubies with the same chemical formula of natural rubies and therefore are just as durable and attractive. 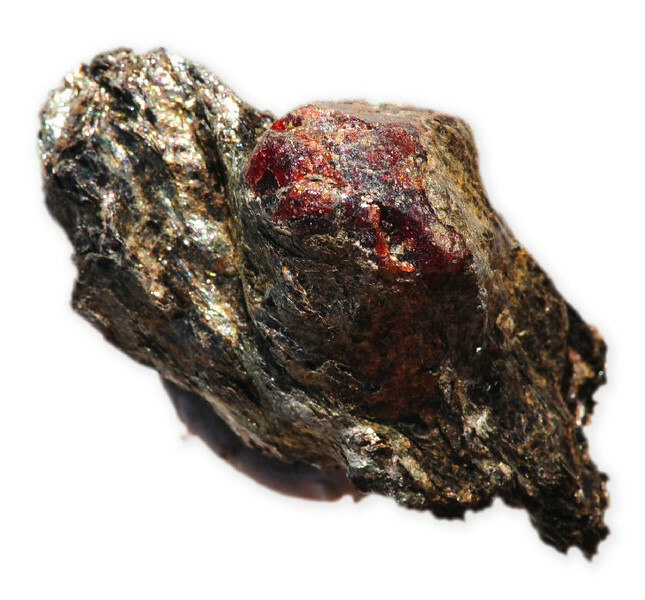 There are various methods to create synthetic rubies including, Geneva, Verneuil, Flux-grown, hydrothermal (this method is very similar to the way rubies are formed in the nature), Czockralski-pulled. It is very important to note that synthetic rubies are less valuable as compared to natural rubies. Therefore, when buying a ruby gem, make sure you ask the seller if the ruby is natural or synthetic. Simulated or Imitation rubies are different from synthetic rubies. Simulated rubies are not real rubies at all. The term simulated (or imitation) is used for gemstones that resemble the look of ruby and can be used as its imitation. 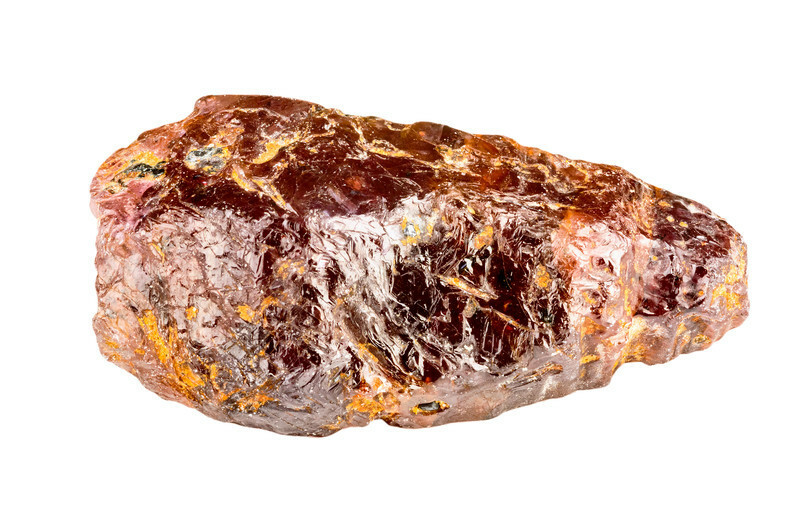 Almandine/pyrope garnet, rubellite tourmaline, spinel, and red glass are often used as the imitation of ruby. It is very important to note that these stones lack ruby’s hardness and fire. Care should be taken when buying ruby gemstone as there are many unscrupulous sellers who will try to sell you a simulated ruby instead of a natural Ruby. Sometimes the location that a ruby has been mined has a direct impact on the value of ruby. Rubies extracted from mines in Myanmar (Burmese rubies) are considered as the most valuable specimens of the gemstone. Other high quality rubies come from Sri Lanka, Madagascar, and Thailand. So, make sure you know where the gemstone you are buying come from.